ASP Spell Check is the comprehensive spellchecking solution for websites and intranet forms written in Microsoft ASP. 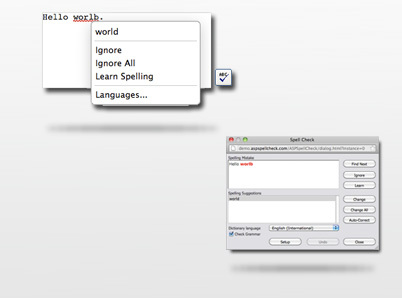 ASP Spell Check provides "Spell-Check-As-You-Type" capabilities across all major web browsers. It also offers a traditional spell-check in an MS Word ® style spell-check popup window. Developer trial licenses are free and do not expire. We also have commercial licenses for as little as $89. Easy To Install ASP Spell Check does not have any installers or Active X because it is written in pure ASP. Just copy and paste to install. Spell-As-You-Type ASP Spell Check provides unique in-context spellchecking for any or all textareas in your ASP application. Spelling Dialog Window ASP Spell Check also provides a classic pop-up style spellchecker that can be applied to any Form, HTML Element, Field or Textarea. Multi Lingual Dictionaries ASP Spell Check has over 20 free dictionaries in international languages as well as medical, scientific and legal English. Active Support by Americans We have maintained our #1 position for 7 years by listening to our customers and responding intelligently.